Concord, CA /PRNewswire/ - The injury and surgery recovery technology leader, Game Ready®, announced today that the company has received 510(k) clearance from the U.S. Food and Drug Administration (FDA) for its revolutionary orthopedic rehabilitation device, the Med4 Elite™. Since the company was founded in 1997, Game Ready's cold and compression system has become the treatment system of choice globally for thousands of leading healthcare professionals. 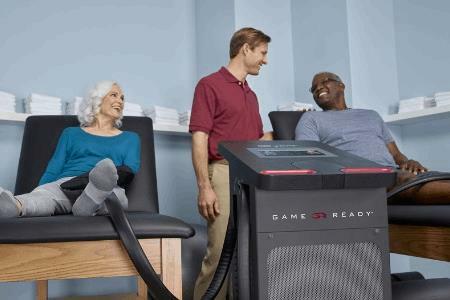 Game Ready's customers are Surgeons, Sports Medicine Physicians, Physical Therapists and Athletic Trainers, who rely on Game Ready for its award-winning technology to improve clinical outcomes and care for their patients. Over a million people worldwide have experienced a better, faster recovery by using the company's products. Built upon Game Ready's patented technology, the Med4 Elite is a powerful rehabilitation tool. Controlled by an intuitive touchscreen computer interface, the system delivers iceless cold therapy, heat therapy, rapid contrast (alternating heat and cold) therapy and intermittent pneumatic compression therapy, providing healthcare practitioners with flexible treatment options for different patients, procedures, injuries and stages of rehabilitation. "The future of orthopedic recovery has arrived," said Craig Grabell, CEO & President. "With the launch of the Med4 Elite we are changing the post-operative and post-injury landscape. This is a landmark moment for Game Ready and our customers. The Med4 Elite features Game Ready's proprietary Rapid Changeover Technology™ for contrast therapy, which allows for a groundbreaking switch from heat at 113 degrees Fahrenheit to cold at 38 degrees Fahrenheit in less than one minute. We are excited to build on the success of our GRPro 2.1, and add additional therapies that will help providers get all their patients back to being their best. Game Ready is not just for world-class athletes. Elite technology for everyone is what Game Ready is all about." Current methods of rapid contrast therapy require multiple cumbersome devices and a large amount of space. The Med4 Elite provides a greatly improved application of therapy due to it's compact but powerful footprint. A wide portfolio of patented, anatomically designed Game Ready Wraps delivers the Med4 Elite therapy for a more effective and comfortable recovery experience. Game Ready also received a CE Mark for the Med4 Elite in August of 2017 and began international sales, with first systems shipped to Spain, France and the United Kingdom. The company attributes its on-going success to adoption by thousands of medical and physical therapy centers, and its expanding international footprint, as well as being prescribed by the most elite surgeons and physicians. Game Ready's clinically effective devices provide the power to accelerate the body's natural repair mechanisms as well as treat symptoms. Game Ready® (CoolSystems, Inc.) manufactures best-in-class orthopedic and sports medicine devices that help healthcare providers improve outcomes and the quality of the recovery experience for their patients. Technology innovation, meticulous testing and development, and a laser focus on customer and patient satisfaction put Game Ready in a class of its own.